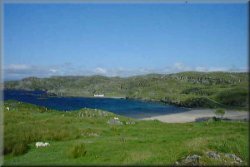 Achmelvich beach is a beautiful white sand beach and this year has won an award issued by Keep Scotland Beautiful and the Tidy Britain Group. Which means they can fly the prestigous yellow flag. This follows rigorous assessment during last summer for water quality, cleanliness, facilities for visitors, safety measures, supervision, access and clear information available for the public. 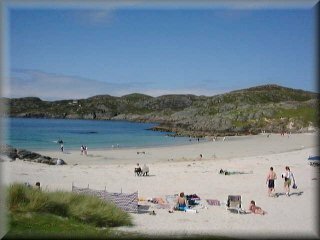 Achmelvich is 3 miles north west of Lochinver and well worth a visit as you can see. There is a camp site and public toliets just off from the beach itself. Clachtoll lies on the far North-West coast of the mainland between Lochinver and Point of Stoer but past Achmelvich. A popular beach with some rugged, rocky terrain including the Split Rocks. This area is described as the last great wilderness area in Europe and is a landscape of stunning beauty. 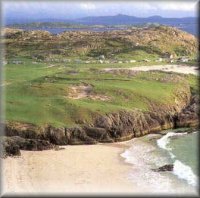 Clachtoll is also hosts to a Caravan and Camping site. Clashnessie Bay is 10 miles north of Lochinver. With a Rocky inlet and big sandy shore Clashnessie beach is clean, sandy and safe for children. One and a half kilometres upstream are the Clashnessie Falls, a fifteen metre fall that drops sheer over a black dyke from the lochans above. There are footpaths on either side of the burn to the foot of the fall. Embo or Dornoch Beach have been awarded a Blue Flag for the second year running because of its lovely clean water. 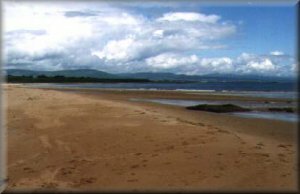 The Continuous golden sands go from Embo round to Dornoch point. There is a children’s play park adjacent to the beach and ample car parking. Dornoch has plenty other attractions to keep you occuiped. There are many other beaches in the North West & North East Of Scotland some sandy some shingle, some of the beaches are secluded some busier but always stunning and never overcrowded. So dont forget your buckets and spades!